Crude Oil, as an energy asset is one of the most popular futures contract for traders. It is one of the most volatile of energy futures contract and in terms of volume, oil futures contracts stand head and shoulders above the rest. The only nearest contract that comes close to Crude oil is natural gas futures contracts. Crude oil futures are standardized exchange traded contracts with a specific quantity of 1000 barrels and comes with monthly expiring contracts. Because oil is one of the most essential commodities which eventually has control over inflation or consumer prices and the volatility that comes with the developing geo-political events, speculators trading crude oil futures can take advantage of the volatility and the liquidity that oil futures contracts have to offer. As a futures trader, you might hear references about Oil futures contract. 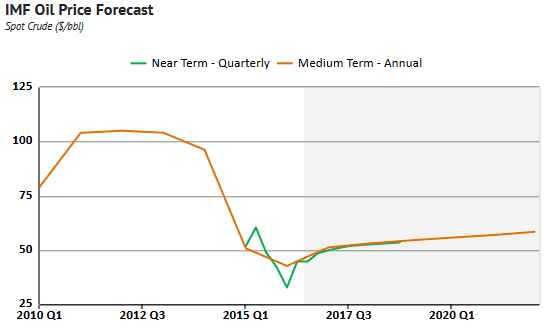 This looks fine on the surface, but when you look to the futures trading instruments it can get a bit confusing. What do you trade? Do you trade the front month oil futures contract or the later months? Why not just trade an oil futures contract that expires in 6 months? Or if you dig deeper, you will find two oil contracts, one from CME Futures and the other from the ICE Futures. And if you fancy some more confusion, Oil is a term that is vague for traders. When someone talks about oil, are they referring to the West Texas Intermediary (WTI) or Brent oil? In this article, you will learn about the most popular oil futures contract, the benefits it has to offer you and more importantly, why traders prefer a specific oil futures contract compared to the rest. We also look at the differences between the Brent oil futures and the WTI oil futures. What is the difference between Brent and WTI Crude Oil? The two most common forms of Crude oil are Brent and the WTI. Although both come under crude oil category, the sulfur content and the API gravity and other technical details make Brent and WTI two completely different versions of crude oil. Other versions of crude oil include the Arab Light, Basrah blend and so on. The Brent blend is basically a combination of crude oil produced from 15 different oil fields in the North Sea and is used in making gasoline. The point of delivery for Brent oil is an island, Sullom Voe, north of Scotland. Brent oil is refined in Northwest Europe and forms the major benchmark for crude oil in Europe and Africa. This means that when oil prices are quoted, they are mentioned in relation to Brent oil's pricing. Sometimes Brent oil is also known as the international price of crude oil. The WTI blend of crude oil is also known as the Light Sweet Crude oil and is also referred to as Cushing Oil. The point of delivery for WTI Crude oil is Cushing, Oklahoma. When the US Energy and Information Administration (EIA) reports on the weekly crude oil inventory report, the WTI crude oil is used as the basis for the report and focuses primarily on the oil inventory outlook for the United States. Still as one of the biggest consumers of crude oil in the world, the EIA’s report is often known to move the markets. 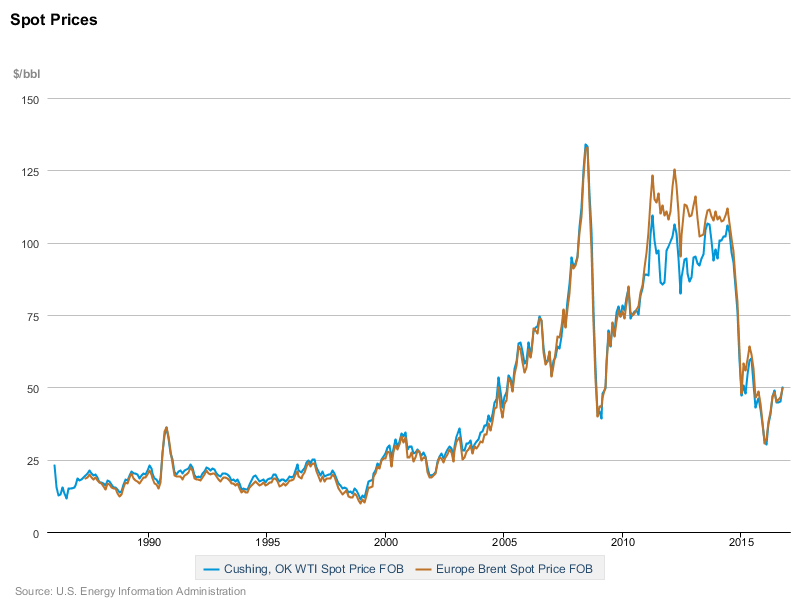 WTI and Brent crude oil pricing is not the same and this price differential often draws many oil traders to trade the spread or to even build intraday trading strategies on the widening and narrowing spreads between the Brent and WTI crude oil versions. In fact CME group and ICE futures exchanges also have other subsidiary futures trading products such as trading the spreads between Brent and WTI for example. While Brent and WTI crude oil are the two most popular oil contracts, there are many other versions of crude oil futures contracts which can be traded, but not many of them are as popular as Brent or WTI as these two attract the highest volume and thus liquidity. In order to understand the types of oil futures contract, we need to start at the very basic, which is the futures exchange where the oil contracts are traded. While there are many futures exchange, only two exchanges stand out globally and ones that are highly references in the financial media, financial reports and analysis. Crude oil contracts come with a monthly expiry, regardless of what exchange they are traded on. When you trade the CME Group's oil contracts, the ticker name is CL and the WTI oil contracts traded at ICE goes by the ticker symbol WI. The chart below shows a comparison between ICE and CME group's WTI Crude oil pricing. The crude oil futures contracts are of many types, listed below are some versions of the WTI Crude Oil futures contract from the CME Group. QM is the ticker name for the e-mini contracts for Crude oil. The main benefit of trading QM oil futures contract is that it comes with lower margin requirements and lower tick sizes. This is a more ideal option for futures traders who have lower trading capital to trade with. The big brother of QM futures is of course the CL futures which has bigger margin requirements and a tick size as well. Below is a brief comparison between QM and CL crude oil futures contracts. The QM and CL are similar to the S&P500 big contracts and the ES (S&P500 E-mini contracts). Despite the CL futures having a larger tick size and bigger margin requirements, it is the more popularly traded crude oil contract compared to the e-mini crude oil contract. This is more evident especially if you look at the trading volumes. However, if you intend to trade the e-mini crude oil contracts, then always make sure to reference your technical analysis from the CL futures chart which tend to reflect a more up to date pricing. A futures contract that is referred to as a "front month" or “Top step” is the contract where the majority of the trading takes place. This is identified by higher trading volume and bigger liquidity. The front month futures contract is the latest month contracts and the prices of the front month are commonly used to quote the prices. Futures contracts and especially oil futures have a monthly expiry date and therefore different months. However, the most commonly used terminology; the front month contract is referenced for the nearest expiry contract. 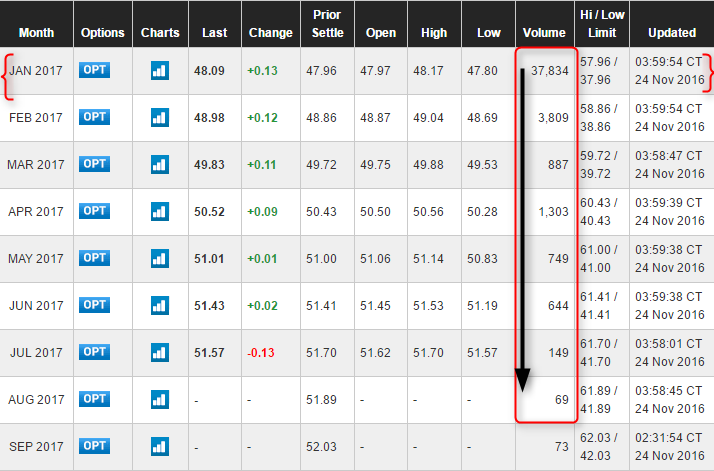 From the above it is should be clear that the CL crude oil futures contracts for the front month are the most popular of all the oil futures contracts. The trading volume chart below gives a summary of Crude oil futures contracts at CME Group highlighting the popularity of crude oil. Depending on the calendar month and the settlement dates, you will be easily able to find the most popular oil futures trading contract. While the current month or the forward month contract remains the most popular futures contract, you might wonder why the December contracts are not listed as the most popular while we are still in the month of November. The above chart shows that the volume for January 2017 oil futures contracts are the front month contracts. It also has the highest volume of 37,834 and the further you look at future contracts, the volume falls. Therefore in any given month the nearest expiring crude oil futures contract is the most popular. However, do not mistake the calendar month as futures contracts trade for a future delivery date. For example, the December oil futures contracts (CLZ) had a settlement date of 21 November 2016, while the first trading day for the January oil futures contract (CLF) opened on 21st November but has a last settlement date of 20th December 2016. 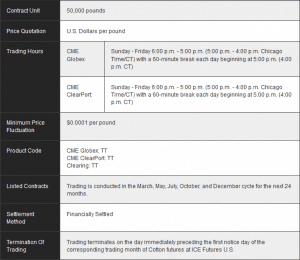 Oil futures contracts have a settlement date around the 19th – 22nd of a calendar month. This can often change however. To be sure, check on the settlement dates for the contracts you want to trade by visiting the CME Group’s product page here and click on the appropriate futures product for further details. In conclusion, as retail futures traders, it makes the most logical sense to trade the CME group WTI Crude Oil futures contracts for the front month. Being one of the most popular oil futures contracts gives additional benefits such as liquidity and volumes which are essential for a futures day trader and even for swing traders. The Oil markets on the whole makes for an interesting commodity with news bytes from around the world and especially the Middle-East keeping volatility alive. This means that with a significant intraday range, trading the CL front month futures contracts can give you a lot of trading opportunities.